Noah Beery was born January 17, 1882, in Clay County, MO, later moving to Kansas City. Because of his deep voice, several of the performers at the Gillis Theatre in Kansas City where he sold lemon drops suggested he try a singing career, and he spent a summer singing at Kansas City's Electric Park. At 16, he headed for New York. His initial work was mainly vaudeville, but he soon was acting in melodramas. After about 12 years on the stage, he went to Hollywood where his brother, Wallace, was already in pictures. 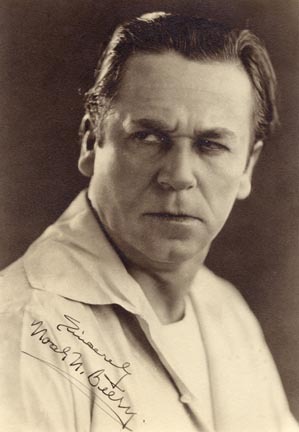 He soon became much in demand as a character actor and, during the 1920's, appeared in many pictures as a villain, portraying particularly despicable characters in such films as "The Vanishing American" (1926) and "The Godless Girl" (1929). His first big role was in Douglas Fairbanks' "The Mark of Zorro" (1920" where as Sergeant Gonzales, he was charged with capturing Zorro, but was more of a genial, bumbling character who, in the end, sided with Zorro. Between 1916 and 1929, Beery appeared in over 100 silent films. His bass singing voice was put to good use in some early sound musicals, and eventually appearing in over 80 sounds films between 1929 and 1945. He was married once, to actress Marguerite Walker Lindsay in 1920. Their first child died in infancy, but their second child, Noah Beery, Jr., went on to a successful acting career himself, most likely best remembered today for his role as James Garner's father in the TV show "The Rockford Files" in the 1970's. Noah Beery, Sr., died of a heart attack April 1, 1946, at his brother, Wallace's, home where they were celebrating Wallace's birthday and rehearsing for a radio program the two were to appear in that evening.